Includes 1800 Watts, 463 Steam Holes, 210g Steam/Minute, Precision Tip, LED Display, 1800 Watts, Electronic Steam Pump 30% More Steam deep into the fabric, Steam Burst up to 210 grams steam per minute, Vertical and Variable Steam, Water Spray, 320ml Tank, Safety Auto Shut Off, Self Clean, Anti Drip, Anti Calc, Stainless Steel Sole plate. Made Germany, Weighs 3.85 Pounds. The DW9280 features the revolutionary Steam Force injection system. The built in pump injection system efficiently combines steam and power to deliver 30% more steam for professional ironing results on all types of fabrics. The READY-TEMP system digitally controls the soleplate temperature and indicates exactly when the desired soleplate temperature has been reached, preventing damage to your garments that can result from incorrect heat settings. Soleplate edges to ensure optimum glide in any direction, especially laterally. 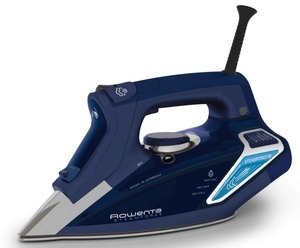 Made in Germany, Rowenta Steamium DW9080 iron features the revolutionary new Steam Force injection system. The built in pump injection system efficiently combines steam and power to deliver 30% more steam for professional ironing results on all types of fabrics. The electronic thermostat and digital temperature display alerts you when the desired temperature for your fabrics is reached. The new Microsteam stainless soleplate is coated with ultra-thin silicate coating for tougher, smoother surface with excellent non-stick and scratch resistant properties. The READY-TEMP system digitally controls the soleplate temperature and indicates exactly when the desired soleplate temperature has been reached. High-precision tip for immaculate ironing even in hard-to-reach place. Microsteam 400 Platinium soleplate provides excellent glide, scratch resistance and optimal steam diffusion. Powerful shot of steam for stubborn creases: 210g/min. Steam Motion Sensor - turns off variable steam when iron is not in motion, conserving water and electricity. High wattage: 1800W for powerful heating. Self-Clean System – Flushes mineral deposits ensuring optimal performance. Anti-Calc System integrated cartridge for extended life of the iron. Anti-Drip System helps prevent spitting and leaking when the thermostat is on a low setting. Extra large water tank with 10.8 oz. capacity fills easily at the tap. 3 way smart auto-off automatically shuts-off the iron for maximum safety: 8min: if left on its heel, 30sec: if left on board, 30sec: if left on its side. Soft Touch comfort and control while ironing. Cool Spray Mist – provides a light mist to remove stubborn wrinkle. Spray function 7 foot electrical cord with 360 degree pivot. Anti Drip: Prevents from water stains on the fabric. Anti Calc: Integrated anti calc system for long lasting irons.